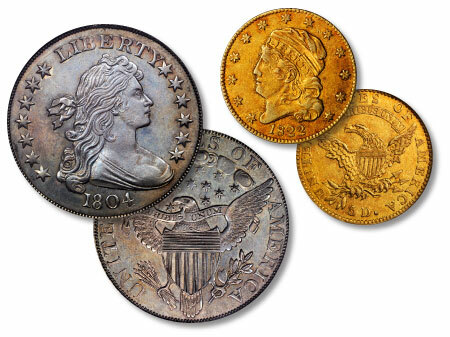 D. Brent Pogue had two favorite coins in his remarkable collection….and they are still his. With all the many rarities that make up the five parts of the D. Brent Pogue Collection Sale hosted by Stack’s Bowers Galleries and Sotheby’s, there were only two coins that had requested reserves: the 1804 Dollar in PCGS PR68 and the 1822 $5 Gold in PCGS AU50. Mr. Pogue absolutely loves these coins, as most of us would, and since his asking price was not met, he was more than happy to retain these two amazing rarities. Now known as the Sultan of Muscat-Childs-Pogue coin, the 1804 Silver Dollar is the finest known in PCGS PR68. It was acquired for this collection in 1999 for just over $4 million which was at the time a world record for all U.S. coins and it stood for several years. 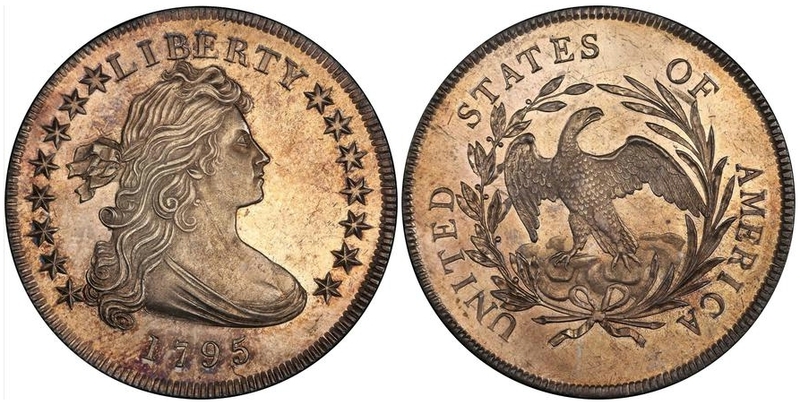 At the Pogue Part IV Sale the 1804 Dollar reached a high bid of $9 million, with the buyer’s fee the total sale was at $10,575,000, which would have been the highest price ever paid for a coin. However, Mr. Pogue decided that he would rather hold on to probably the most notable coin in U.S. history. Mr. Pogue also placed a reserve on the 1822 $5 Gold, certified by PCGS as AU50, which is by many accounts the rarest U.S. coin because it is the only one available to be held in a private collection. There are only 3 known to exist and the other two are in the Smithsonian. This coin has been off the market since 1982 when it was then purchased for $687,500 for the Pogue Collection. At the Pogue Part IV Sale the highest bid for the 1822 $5 Gold was $6.2 million which would have been $7,285,000 with the buyer’s fee, but the reserve was not met. Now for some of the rarities that found new homes. The depth and quality of the D. Brent Pogue Collection Sale Part IV was nothing less than phenomenal. A spectacular 1795 Draped Bust Dollar that was graded SP66 by PCGS brought $1,057,500; it is the highest certified of this variety and came from the world famous Garrett Collection and most recently the Jimmy Hayes Collection in 1985. It was originally described as a Proof in a 1980 issue of Coin World. 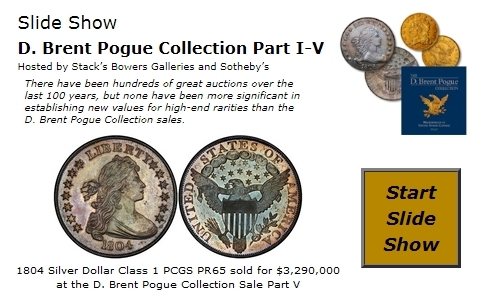 Below are some of the more important coins sold in this latest Pogue sale. The coins in this sale are certainly of the highest quality for the date and denomination and they have excellent eye appeal. The 1837 Capped Bust Half in PCGS MS67 is the finest known although the PCGS and NGC population reports indicate there are a total of five coins certified in this grade, and one of them is CAC approved. The previous FMV for this coin was $83,130. The 1839 O Bust Half in PCGS MS67 is the only one certified in this grade by PCGS with none higher. The FMV for this coin was $175,000 and will surely need an adjustment to a higher level. The price realized for this rare 1839 O beat the high estimate prior to the sale by over $60,000. The New Orleans minted coins are very popular, especially for Half Dollars, Dollars, and Gold. The 1795 Draped Bust Dollar Off-Center variety MS66 is the finest certified by PCGS with none recognized by NGC. This coin brought nearly 10% over the high estimate as listed in the catalogue. It is the Eliasberg coin and was sold on more than one occasion by Bowers and Merena before finally ending up in the Pogue Collection. Another 1795 Draped Bust Dollar in PCGS MS66, but this one the Centered variety, realized almost 75% above the pre-sale estimate. This is the only PCGS coin listed in this ultimate grade although NGC does have one certified in MS67. All Capped Bust $5 Gold coins are rare in high grades, but the 1825/4 in MS64 is one of the toughest, and until this sale we did not even have an FMV listed in the grade. The coin sold is the highest graded by either service and there is only one other certified in Mint State; an MS63 by NGC. Another of the prodigious rarities that was purchased from the Eliasberg Collection, it realized $140,000 above the catalogue estimate. The 1828 $5 Capped Bust is a very special coin in that it is the highest certified at PCGS MS65+ and there are only four other lower Mint State coins certified; one being an NGC MS65. This coin traces back to the Colonel Green Collection and became the centerpiece of several collections that followed. The price realized of $458,250 was well above the high estimate prior to the sale. The D. Brent Pogue Collection Sale Part IV realized over $16 million and this is without the sale of the ‘Big Two’, which could have added an additional $17 million.